Tim Murphy (1956-2013) was Associate Professor of Religious Studies at the University of Alabama. He received his Ph.D. in the History of Consciousness Program at the University of California, Santa Cruz. His books include Nietzsche, Metaphor, Religion (SUNY Press, 2001) and Representing Religion: Essays in History, Theory, and Crisis (Equinox Publishing, 2007). His research has followed two tracks: a critical genealogy of the field of Religious Studies and constructive attempt to theorize religion using concepts derived from poststructuralism and semiotics. 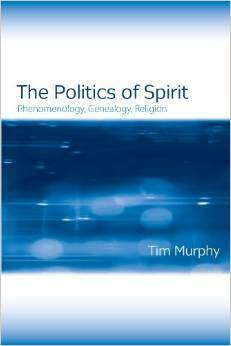 His book, The Politics of Spirit: Phenomenology, Genealogy, Religion, shows how, since Hegel the science of consciousness, or phenomenology, has taken the form of the study of Geist or “spirit,” which is always defined in opposition to nature. A genealogical rereading of major texts traces this Hegelianism as it is found in the phenomenology of religion. Using colonial discourse theory, these rereadings demonstrate how phenomenology’s representations of religion replicate the structural relations between colonizer and colonized: non-Europeans of color are “nature,” while Europeans are Geist. The very idea of “consciousness” turns out to be a kind of latent politics. These rereadings call for a radical rethinking of the foundations of Religious Studies. Craig Martin: I get the impression from reading the book and from some comments you’ve made that you see this book as a part of an ongoing project—continuing the work you did in Representing Religion and looking forward to another book on the semiotics of religion. Can you comment on what prompted you to write this book and how it fits into your larger project? Tim Murphy: What prompted me to write this book is a long, long story with many twists and turns. The short version is that I started this as research project with my late advisor, Gary Lease in my first year in the History of Consciousness Program. The idea was to apply the poststructuralist critique of phenomenology to the phenomenology of religion. No one had really done that back then, so that was even more incentive. The middle part of the story is messy, but the project sat in a desk drawer for years and I wrote my dissertation/first book, Nietzsche, Religion, Metaphor instead of pursuing this project. Bryan Rennie graciously invited me to submit something to his SUNY series, Issues in the Study of Religion, and we agreed that this project would work well for that series. If this had been my first book, it would have been much timelier. By now, the field has somewhat caught up to these ideas. The intellectual reasons for doing this project were clear to me: the phenomenology of religion, and all its residuals in the academic study of religion, was not only wrong, but an obstacle to the discipline. If we were going to understand religion we had to get rid of it and all its vestiges. I stand by that even now. So that’s the critical component of my work. I am embarking on a constructive phase in which I am using semiotics as the basis for developing a full-blown theory of religion with Peter Berger’s The Sacred Canopy and Roland Barthes’ Elements of Semiology as rough models for a future monograph entitled, “By this Sign You Shall Conquer”: Elements of a Semiotic Theory of Religion. That is the larger project you rightly recognize. CM: In the book you relate the origins of the “phenomenology of religion” to Hegel rather than Husserl. Before reading your book I was struck by how little the phenomenology of religion had in common with Husserl, and I was persuaded by your argument that it really goes back to Hegel (or a least a certain right-wing Hegelianism). If you’re right, how do we account for the popular misperception that phenomenology of religion is Husserlian at bottom? TM: In order to understand Hegel’s influence you must see that the Geisteswissenschaften were, for all intents and purposes, predicated on Hegel’s vision, especially as articulated in the Encyclopedia—which most Americans never read. That was gospel in the German academy in the 1830’s and for a long time after. A genealogy of Geisteswissenschaft allows us to see how Continental scholars came to think about culture, history, literature, and religion. From the Geisteswissenschaften, Religionswissenschaft emerged. You have to remember that since its inception Geisteswissenschaft was at war with positivism. This war shaped the discourse considerably. We will never understand these scholars if we do not grasp this important fact. It wasn’t “right wing” per se, but only as positioned and described by Marxist readings. It is easy to let the Marxist narrative of Hegelianism distort much of the latter’s impact. While it was mostly conservative, there were a few Liberals in that crowd. But it was within the virtually unconscious, assumed Hegelianism that German scholars worked. You might think of it like this: “Hegelianism” became something like the notion of the episteme as Foucault describes it. Husserl also was trying to develop a “science of consciousness.” The Religionswissenschaft people found a couple of things in Husserl. One was the air of scientificity. This was attractive because, again, of the conflict with positivism. Second, the epoché. This was extremely useful for getting out of the “myth is bad science” model. Eliade repeatedly said: “the sacred is a structure of consciousness, not a stage of history.” It liberated Religionswissenschaft much of which quickly became phenomenology of religion. Seeing the Husserlian terminology without knowing the genealogy of Geisteswissenschaften, people assumed that the phenomenology of religion was Husserlian. In reality, it was the study of Geist with a few Husserlian trimmings. This entry was posted in Craig Martin, Interviews, Religion and Theory, Theory and Method and tagged Bryan Rennie, Colonialism, Dilthey, Elements of Semiology, Eliade, Eurocentrism, Geist, Geisteswissenschaft, Genealogy of Religious Studies, Hegel, Hegelianism, Husserl, Marxism, Metaphor, Nature/Spirit, Nietzsche, Peter Berger, Phenomenology of Religion, Positivism, Postcolonialism, Poststructuralism, Religion, Religionswissenschaft, religious studies, Representing Religion, Roland Barthes, Rudolph Otto, Schleiermacher, Science of Consciousness, Semiotics, Socrates, Spirit, The Politics of Spirit, The Sacred and the Profane, The Sacred Canopy, Tiele, Tim Murphy, Vivekananda. Bookmark the permalink. Tim was a great friend and an inspiration. The more time passes since his death, the clearer this fact becomes for me. I am glad to have known him when he was still moderately in good health. He was never in poor spirits, so that trait never left him. However, it was clear toward the end (I saw him last in 2012) that he was suffering physically. I’ve barely grazed the surface of his work. I still have two of his books, this one and the one on Nietzsche. I had the blessing of hearing the truth from the horse’s mouth, but now that he has passed, I have found occasion to come back to the texts and am always shocked at the guy’s breadth of knowledge. In part what inspired me to read so broadly.